After starting Kontact (nepomuk and strigi enabled) virtuoso-t process constantly eats 48-50% of CPU -- which means that it might have 1 core only for itself. To change the source package that this bug is filed about visit https://bugs.launchpad.net/ubuntu/+bug/894841/+editstatus and add the package name in the text box next to the word Package. 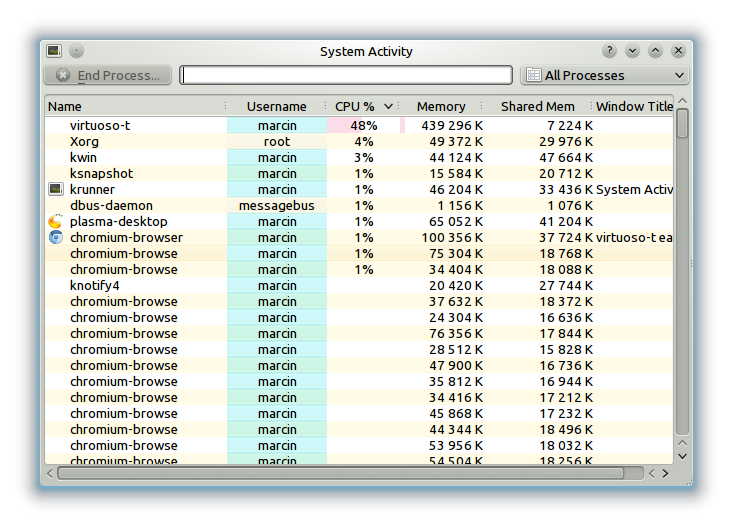 virtuoso-t wastes lots of CPU time on my 6-core machine. Particularly, it utilised multiple cores. I am using 64-bit Kubuntu Oneiric, with updates to KDE 4.8.0. This problem exists since the update to KDE 4.8.0. Affects me on Kubuntu12.10 amd64. Kontact won't shut down Akonadi when you quit it so I always have to terminate it manually via commandline. Can someone please start working in this issue OR modify Kontact to terminate Akonadi when exiting? If Kontact did tell Aknoadi to shutdown when Kontact is shutdown, it would at least be possible to end the CPU usage through the UI.